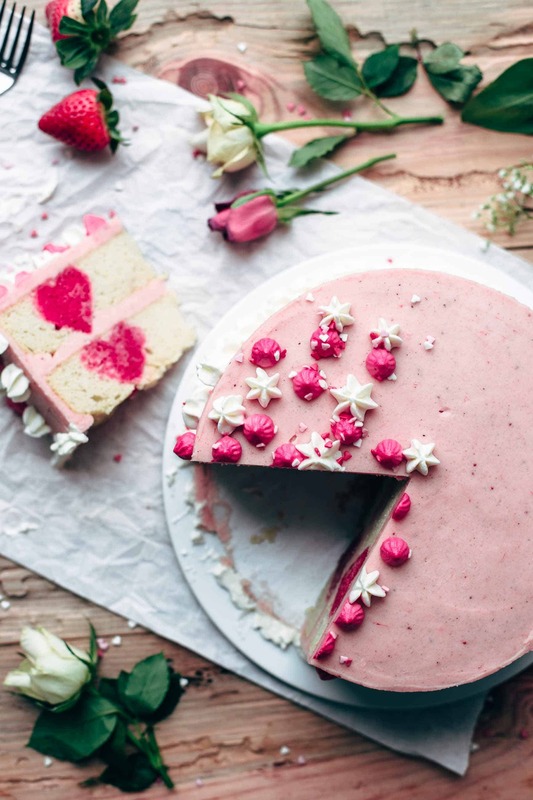 This White Cake with Strawberry Frosting is the perfect cake for Valentine’s Day. Watch the step-by-step video to make this beautiful and delicious cake. 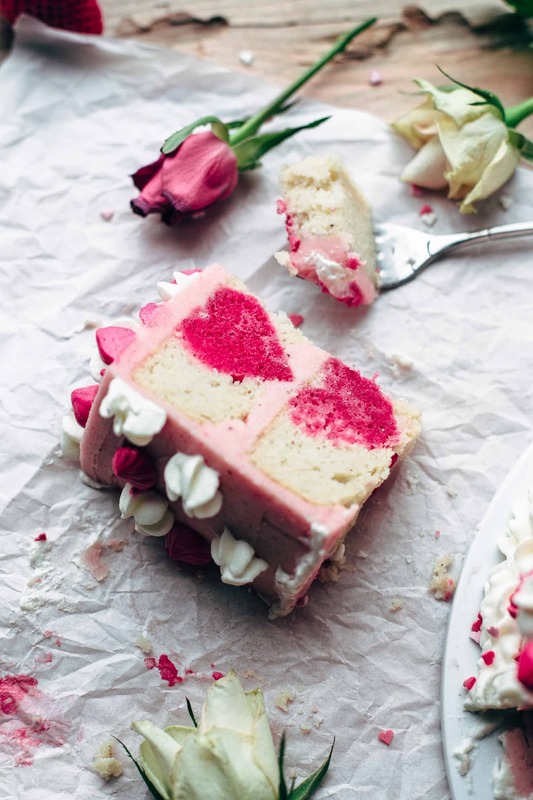 What says more “I love you” than a strawberry buttercream frosted white cake with red-pink marbled hearts in it? I have no answer to this either. I consider myself as a humble person. I’m super happy and moved to tears when my sweet darling bakes something for me for Valentine’s Day or my birthday. This is the biggest gift a partner can give when he/she invests time instead of money to make you happy. It’s not that hard as it might look like to make this White Cake with Strawberry Frosting. Of course, it takes some time, but your Valentine or you are totally worth this time. 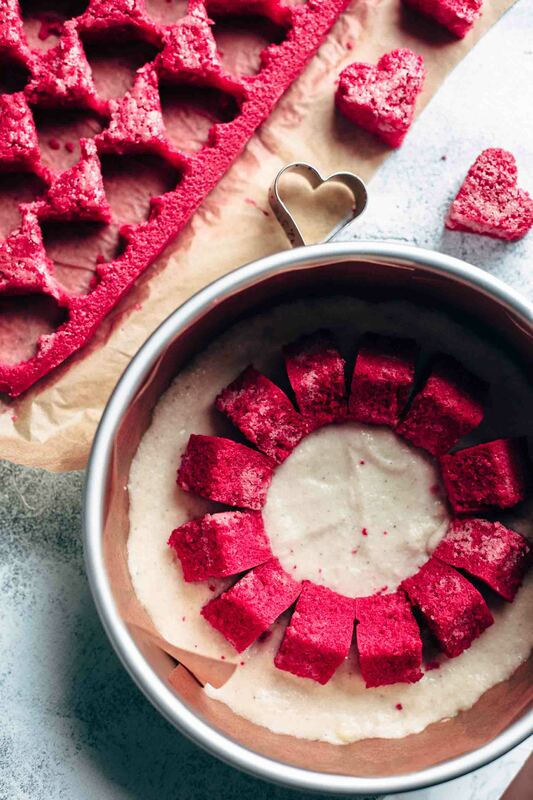 The hearts are made of the same batter as the rest of the cake. I chose white cake because it has a great vanilla taste and it is super bright. There are two advances to choose a white cake for this cake. First of all, it has almost no color, and the hearts are beautiful inside a bright white cake. They literally pop inside your eyes. The second advance is that it is easy to color white cake. You don’t need a lot of white color to brighten up the cake before coloring because it already is super bright. White cake is just simple vanilla cake. The only difference between white cake and regular vanilla, or yellow cake, is that there are no egg yolks in the batter to avoid a yellow tint. The frosting is probably the best of the whole cake. It is so super delicious that you will go crazy. To get a super intense strawberry taste to your strawberry frosting, take one heaping cup of fresh strawberries, puree them, strain through a fine mesh strainer, and bring to a boil. Cook until it is reduced by half. You end up with a thick strawberry jam-like consistency that is pure gold. Two vanilla beans take the strawberry frosting to the next level. It tastes like strawberry ice cream but just with a buttercream frosting texture. Actually, the taste can’t be described with words. It is just….awesome. If you want your darling to bake this cake for you as a “surprise” maybe he/she gets a clue of this recipe…you know what I’m saying? 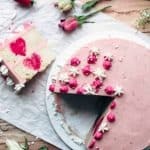 Make this White Cake with Strawberry Frosting recipe, leave a comment, rate it and tag a photo #alsothecrumbsplease on Instagram! Would love to see your snap! 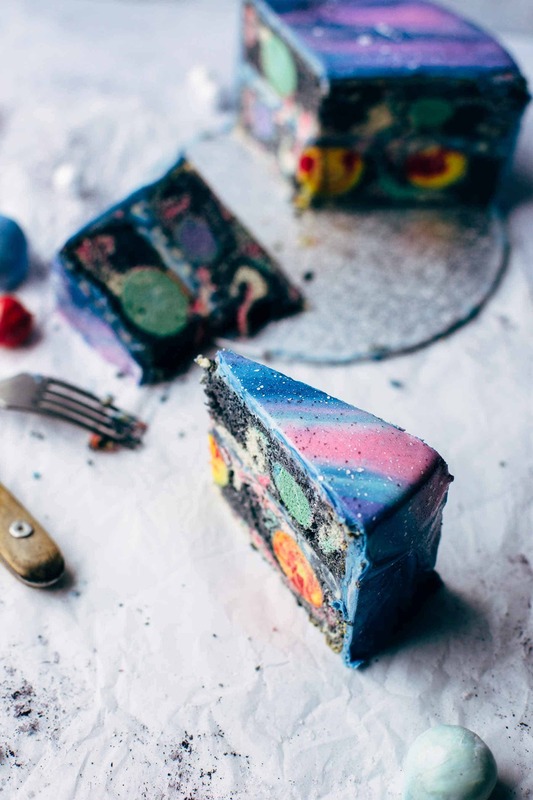 You may also like Mirror Glaze Galaxy Cake, Marbled Pumpkin Cake with Maple Frosting, or click here to see all things sweet. This White Cake with Strawberry Frosting is the perfect cake for Valentine's Day. Watch the step-by-step video to make this beautiful and delicious cake. Preheat oven to 350°F / 175°C. Line a 9x13 baking pan with parchment paper. Set aside. Stir flour, baking powder, and salt to combine. Set aside. Combine milk, egg whites, and vanilla* and stir to combine. Set aside. In a large mixing bowl, mix butter and sugar with a handheld or stand mixer fitted with a whisk or paddle attachment on medium speed until creamy. Alternately add dry and wet ingredients, beginning and ending with dry ingredients. Mix on low speed just until combined. Separate batter in 2 bowls and color one with pink and one with red food coloring. Alternately transfer batter to the prepared baking pan and draw a few swirls with a knife to get a beautiful pattern. Bake for 25-27 minutes or until a toothpick in the center comes out clean. Let cool to room temperature (about 30 minutes). Use a 1.6-inch (4cm) heart-shaped cookie cutter and cut out cake hearts. You need about 24-26 hearts for the cake. Set aside. Save the rest for other baking projects like cake pops, or just eat them. Preheat oven to 350°F / 175°C. Line two 8-inch baking pans with parchment paper by cutting 8-inch circles for the bottoms and about 2-3 inch wide strips for the sides. Use very less baking spray underneath the paper that it sticks to the pan for easier filling. Spoon a few spoons of batter in the two pans equally until the bottom is thinly covered with batter. Place about 12-13 white cake hearts in a circle in each pan upside down. Spoon remaining batter on top of the hearts. Bake for about 27-30 minutes or until a toothpick in the center comes out clean. Let cool completely. Blend strawberries with a handheld emersion blender until smooth. Place a small saucepan over medium-high heat and set a fine mesh strainer on top. Pour strawberries through the strainer into the saucepan. Press fruit and liquid through the strainer and discard solids. Bring to a boil and cook until it is reduced by half, for about 10 minutes. Let cool to room temperature. Mix butter with a whisk attachment on medium speed until creamy for about 2 minutes. Alternately add 1 cup sugar and 1 tbsp strawberry puree at the time and mix on low speed until combined. Add salt and vanilla* and mix until smooth and fully incorporated. If the frosting is too thick to spread, add 1 tbsp milk at the time until you reach the desired consistency. Place bottom cake layer with a cake board underneath on a turner. Pipe or spread buttercream on top. Even with a spatula. Place the second cake layer on top. Pipe or spread remaining buttercream on top and the sides until the cake is fully covered. Level the top and the sides with the spatula until buttercream is smooth and even. Smooth the edges by leveling the top and push frosting very slightly and carefully to the edges. Then level the edges on the sides again and repeat until edges are smoothed. Chill in the refrigerator for at least 3 hours. Decorate as desired before serving. Store leftovers in an airtight container in the fridge up to 3 days. This recipe, post, video, story of your husband, and pictures–basically everything about your site–deserves a huge dose of acknowledgement and admiration. What you do with your website, Sabine, is just spectacular. I hope you get a million visitors because they could learn a lot from your artistic eye. Everything about this page is beautiful–and your recipe! No words, just pure YUM. I hope you know how gifted you are. You’re husband is a lucky guy. Thank you for sharing your gifts with the rest of us not-so-talented Earthlings. THANK YOU SO MUCH, Amanda! I really appreciate your words, and I’m beyond happy that you like my recipes and my blog. I love to share all my recipes with you. I’m far away from a million visitiors but the only thing that counts is that every one of them like what they see. Have a great weekend, Amanda. Awww, this is so nice ❤️ thank you very much! Happy Valentine’s Day.